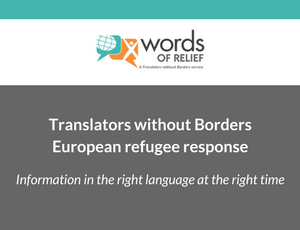 Since September 2015, Translators without Borders has deployed its Words of Relief response program to support local and international humanitarian agencies working to assist refugees and migrants arriving in Europe. Since the response began, Rapid Response Teams in Arabic, Farsi, Greek, Kurdish, and Urdu have provided over 800,000 words of immediate, high-quality translations in multi-media formats, to aid organizations responding along the refugee route. By working with partners, we estimate to have reached 100,000 people with content related to protection, asylum procedures, and basic services. This factsheet provides a summary of the services that TWB is offering to aid organizations responding in Europe.